A problem concerning their child is what bothers parents, the most. Many parents experience that sometimes their child starts crying for no rhyme or reason and does not stop crying after some time. They get worried because they cannot understand what the problem could possibly be. In a previous article I have given a special charm to placate a crying child. The charm given in this post is a similar healing spell and also works if the child is frightened of the dark and does not go to sleep, due to fright. The charm can be written on White Paper as shown in the image given below. A paste of Saffron has to be used as the ink for writing the charm and a pointed stick of the Pomegranate Plant as the writing instrument. 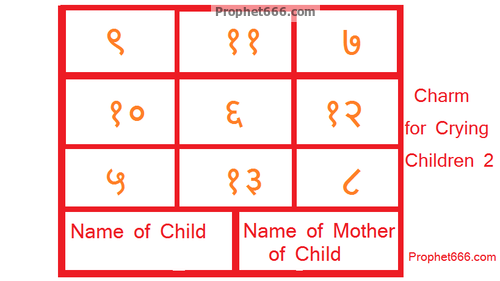 The name of the child and its mother have to be writen in the botton compartments of the charm. Then it has to be put in any kind of Metal Locket or a Cloth Tabeez and tied around the neck of the child as a healing Talisman. The Yantra does not require any kind of worship or energising Sadhana and can be put to use straightaway once prepared. The pomegranate stick is as per the recommendations of the Tantra and can be easily acquired. If unable to do so, then try using any other pointed wooden stick.